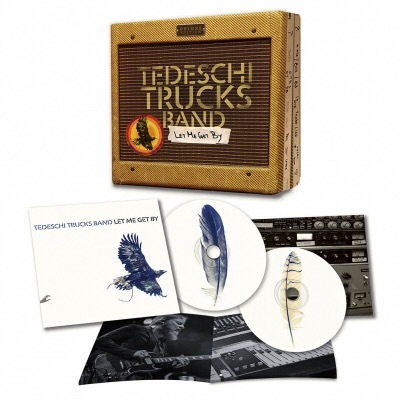 I look forward to the every release from the Tedeschi Trucks Band (TTB). This is the equivalent to comfort food for my late 50’s ears: a mix of rock, blues, soul and funk – spiced with virtuosic chops. By no means do I want to suggest by comfort food that I mean some kind of bland tater tot casserole, I mean an old family dish that has been handed down from generation to generation. Something you crave and when you take that first bite you are intensely satisfied: rich in flavor, tradition and memories. Susan Tedeschi is heir to the throne to the great Bonnie Riatt – a sassy bluesy singer who can also rock the guitar. Derek Trucks assumed the throne of the late great Duane Allman in The Allman Brothers Band. Interesting tidbit: the year opened with a great album – Bowie’s Blackstar. TTB bassist Tim Lefebvre plays on Blackstar and Let Me Get By. So there is some pretty amazing pedigree here. For many years Derek Trucks solo efforts were interesting blues-rock studies, but they lacked something. When he and his wife decided to resurrect the ghost of Delaney and Bonnie to create the TTB, it was pure magic. This is their third studio album and they are continuing to issue top quality jams. The vinyl LP is the most expensive option, yet it lacks the bonus material. You should be able to buy the vinyl and download a FLAC of the standard album and get the bonus material. Instead I had to compromise and buy the deluxe CD version. Fortunately I have a pretty amazing CD player that sounds great. I can’t say this is the best TTB album because they are all great. This is a gem, but the other two at gems too. The band seems to have found a comfortable place, one that allows them to branch out into new sounds like on “Right On Time” which has a bit of Broadway/Tin Pan Alley feel. That song features Minneapolis native and songwriter Mike Mattison. One of the great things about the TTB is that is is a “big band”- 12 members strong! As far as the bonus material, it is totally worth it (a rarity). There are some alternative cuts, some cool cuts that did not make the main stage (Bowie’s “Oh! You Pretty Things” is so perfect, given the moment and bassist Tim Lefebvre recent connection to Bowie). Five of the bonus cuts are only available for purchase, but the last three live cuts are on Spotify. The real treat of the live cuts is to hear Sussan Tedeschi cut loose with absolutely shredding vocals. If you are a fan of classic rock, but are sick of the same old songs, pick up anything from the TTB catalog and you will feel like you found a great lost artist from the 70s. Let Me Get By is as good a place to start as any. It’s just blues-rock craftsman spitting our yet another masterpiece.